In the last post on dynamics we looked at how I can work out what volume to play at when learning how to read sheet music. In this post we’re going to look at the other two crucial questions with regards to dynamics. Should I get Louder or Quieter? The next question to ask is whether I should be increasing or decreasing the volume of my performance. This is shown through a line or word underneath the stave. So, the following scale…. ….should be played getting gradually louder. This is a crescendo (Cresc.). ….should be played getting gradually quieter. 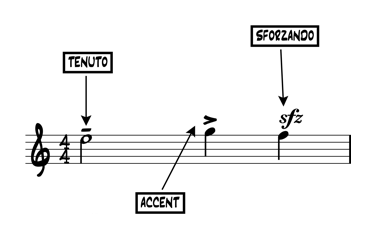 This is a diminuendo (Dim.). How loud should I play this particular note?